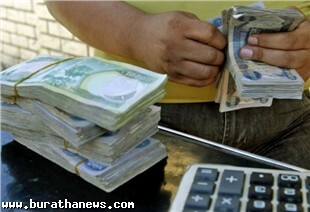 Issued CBI, new instructions to stabilize the exchange rate of the Iraqi dinar against foreign currencies select the stakes weekly for banks and remittance companies and trading firms currency from the dollar appreciates as capital each, and will increase and decrease of this share exchange for a commitment each delivery amounts they want customers citizens. He said the Iraqi Central Bank in a statement issued on Sunday evening that this directive was intended to stabilize the exchange rate of the Iraqi dinar against foreign currencies, and meet the needs of the private sector of foreign currency to import goods and services, as well as to encourage banks to increase its range of services to meet the demands of its customers in foreign currency . According to the instructions, the Iraqi banks, they can buy $ 4 million subject to increase or decrease as a share of weekly for banks in the light of its commitment to the delivery of the currency of the beneficiaries of the citizens at specified prices by him. And was instructed to sign acting central bank governor, Abdul Basit Turki, in the wake of the original conservative separation Shabibi by the Iraqi Council of Ministers, and will take effect from April 15 next. And These instructions replace previous instructions that were issued during the months of October, November and December 2010, as well as previous instructions issued in the months of January, April and June and July 2012 respectively. In the case of companies buying and selling currencies, given new instructions for each company the right to buy $ 50 thousand dollars a week as a share provided that at least the company’s capital for $ 500 million Iraqi dinars equivalent to about 420 thousand dollars, and companies with less capital for that amount right to buy the amount of 25 thousand dollars a week. The CBI organizes daily periodic auctions to sell the dollar, most recently on Sunday, March 24, 2013, and participated in this auction, 23 banks, the central bank sold 169 million and 343 thousand dollars at 1166 dinars to the dollar.